That's what I USED TO say ... until July 2006, when my cat Katie forced me to draw. There I was ... sitting in my lounge chair reading a book, with my feet up and Katie sleeping between my knees as she often did. Have you ever lived with a cat? 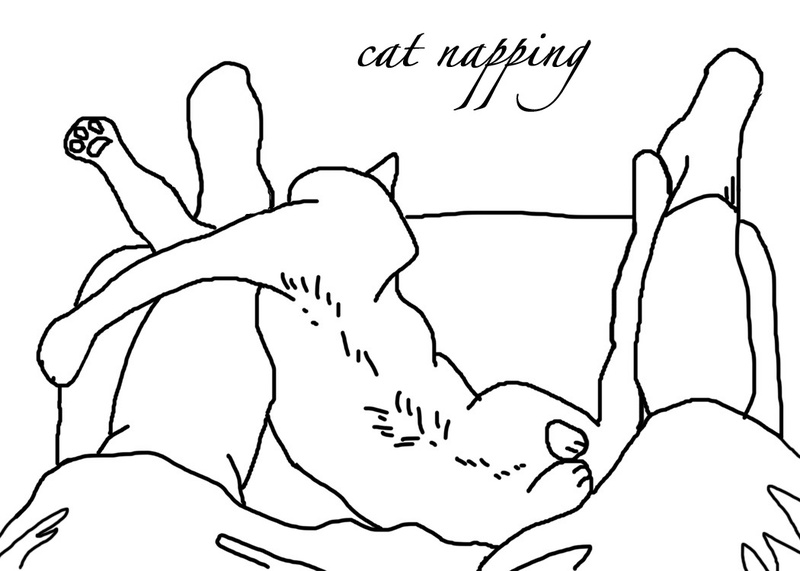 Do you know the cat-cushion position? That's the one where they curl up tight -- showing no face, legs, or head; they're just a ball of fur. That's the position Katie started in that day. So... After a bit of reading, I feel this rustle, rustle, rustle and look down to see that my cat-cushion has grown two towers! ... with toes !! Cute. I admire her and go back to reading. Again I feel rustle, rustle, rustle and look down to see that now her front legs are stretched out. The toe-towers are still there, too. I couldn't reach my camera, my husband wasn't home, and moving would have disturbed her; so I had to give up on taking a picture ... as the photographer in me would have liked to do ... and just admire her creativity. Ah, but she is CUTE! Now she's got her head hanging off the the chair! No one is going to believe this position she's gotten in to! Still no camera, no husband. 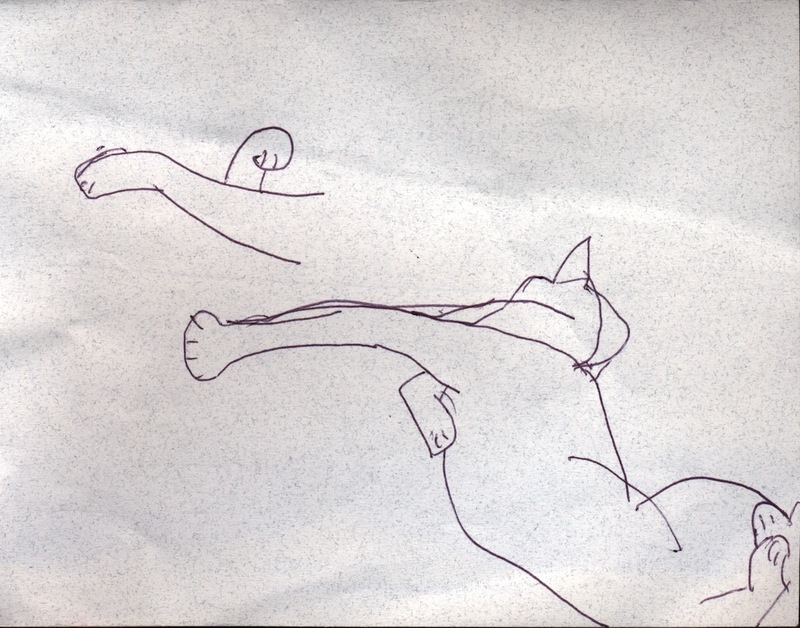 In desperation, I try to just capture the SHAPE of her position by scribbling on the back of a grocery list. I get one contortion outlined ... then she shifts ... I start over, draw a leg ... shift... more leg drawing ... SHIFT ... ah, finally she's settled down. This time facing up. But these drawings came out so well that I kept a sketchbook next to my chair in the following months and now have many drawings of my cat. I hope folks enjoy Katie in all her many napping poses.